When you think about it (and few outside this business do) it’s an awesome responsibility to be the ones who return wastewater to the ecosystem to replenish the supply. In fact, the only time people in the community think of how it all works is when something goes wrong and it doesn’t work. But, that’s why we’re all in this business – to see to it that drinking water is clean and safe and wastewater is disinfected and clean of toxins and contaminants that can make fish, wildlife and people sick. We do significant testing throughout the day on the wastewater we manage, including pH, DO and more. These are not required to be analyzed by a certified lab, but of course, they are critical to the management process. Certified operators must review and report on the results, which we do. For those tests that must be done by certified labs, we work with some of the best in the Midwest. To live up to our awesome responsibility, we work with labs that meet state and EPA certification requirements. We review their lists of parameters and sampling methods to assure those parameters and methods meet our standards which are based on the discharge permits for the facilities we operate. The requirements for certified lab tests are expected to increase with stricter regulations being written into permits to run plants because of increased pollution levels. In some instances even now, labs have to meet required architectural design standards to perform tests. We operate the plant in Clarinda, Iowa, that is configured appropriately. See next article featuring Harry Ridnour, who runs that lab. Assuring that wastewater is ready to be released into the ecosystem is very important to the ecosystem. It’s also very important to the overall financial health of the community. Most of you reading this are responsible for your community’s growth and sustenance. With population and economic growth comes more pressure on the system. Once upon a time we could let Mother Nature take care of wastewater clean-up for our communities. She did a great job. But, with population and industrial growth, she really can’t keep up, so we have to speed up ways to get the job done and avoid polluting the natural water ways. An accidental release of non-clean water or too much of a chemical could be disastrous to your economy and the health of the people you serve. Not every community is as prepared as they should be for what’s coming in regulations – particularly communities that intend to grow. The need for certified operators is great, and that’s why PeopleService is a smart choice. 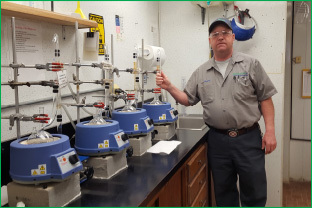 We hold sacred our preventive maintenance program and constant observation and testing of water and wastewater in the plant and with our valued lab partners. We hold high the responsibility and ethics of this industry and constantly strive for improvement in the education of our team members, so you are assured that all permit requirements are being met.